Spanish Food: The Early Days. If we want to push the limits on Spanish food, we can go back to the Upper Palaeolithic Period (ca 40,000 to 10,000 years BC) and deduce from early cave art some of the food probably eaten by the earliest inhabitants of the peninsula. Animal paintings of bison, boars, deer, horses, for example on the ceiling of the Cave of Altamira (roughly 34.000 years BC) and in other caves in the north of Spain suggest that hunting meat –probably by spears– was a major food source. It is also likely that these early inhabitants foraged for fruit, nuts, wild berries, leafy vegetables, seeds or grains from wild grass, and snails and insects.Those living on the coast undoubtedly added fish and shellfish to their diet. Another series of paintings known as Rock art brings us closer in time and provides a remarkable narrative of social interaction. 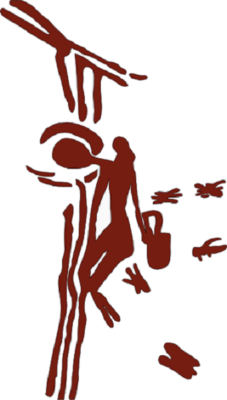 Located along the Mediterranean coast of Spain, these works are thought to be from the Mesolithic Age (about 10,000 to 5,000 years BC) and are painted on shallow open-air spaces or natural cavities. They depict a wide variety of human, communal activities: e.g. groups hunting with bows and arrows, fighting, religious rituals, funeral rites, dancing, and harvesting. One of the most striking scenes is to be found in the Cave of the Spider (Cueva de la Araña) situated about 10 kilometres (6 miles) from the municipality of Bicorp, south west of Valencia. It depicts a human figure gathering honey. The figure clings to some vines seemingly with her/his knees while reaching into a bees’ nest with one hand. With her/his hand, s(he)grasps a bag; close by some bees hover, as if disturbed by the intruder. The communal activities of these people suggest settled, organised groups who gathered and stored foods similar to those of the Altamira dwellers: meat, grains, berries, nuts, fruit, leafy vegetables etc. And, of course, honey! By the end of this period, ale –made from barley, probably the oldest cultivated cereal in the world —may well have made an appearance. Between the Neolithic (ca 5,000-ca 2500 years BC), Copper (ca 2500-1700 years BC) and Bronze (ca 1700-700 years BC) Ages, village life took shape and early forms of organised farming were developed. From about 1000 BC to 300 BC migrating groups of Celtic tribes entered the peninsula via the Pyrenees and established themselves along the north coast and down the west, probably subjugating those already living there. They gradually progressed inland eventually meeting with the Iberians whose origins are still unresolved (possibly descendants of the Rock art peoples or later migrators who had crossed from North Africa). What happened along common borders is conjecture. Some believe that the Celtic and Iberian tribes mingled and formed a separate culture. Others argue that tribal identity was so strong that they would have remained apart. The Romans simply identified them as Celtiberians, and the name has since been used as a convenient way to describe the confusing medley of tribal groups that inhabited the area. Since the Celts and Iberians left little or no written evidence of their presence, much of what we know about them we owe to Greek and Roman geographers or historians. ***This early distinction between butter and olive oil is interesting because it weaves its way into Spanish history, becoming in the late 15th and 16th centuries a significant way of determining the religious affiliation of conversos and moriscos (converted Jews and Moors) in a politically unified Christian country. Besides olives, Strabo also identifies grapes, figs, and similar plants (he doesn’t specify), that enriched the Iberian coast (III, 4, 16) and its hinterland. These and other foodstuffs (e.g. olives, almonds, chickpeas, cereals) were introduced primarily by the Phoenicians (8th century BC) and Greeks (7th century AD) and Carthagininas (6th century BC). However, it was the arrival of the Romans that marked the first significant stage in Spanish food history. Roman presence in the Iberian Peninsula (i. e. modern Spain and Portugal) extended over 600 years; it was inevitable, then, that Roman culture would have a wide and profound influence, including food. Collins, Roger Spain: An Oxford Archeological Guide Oxford, New York 1998. Roden, Claudia The Food of Spain New York 2011. Trutter, Marion ed. Culinaria Spain Cologne 1999.